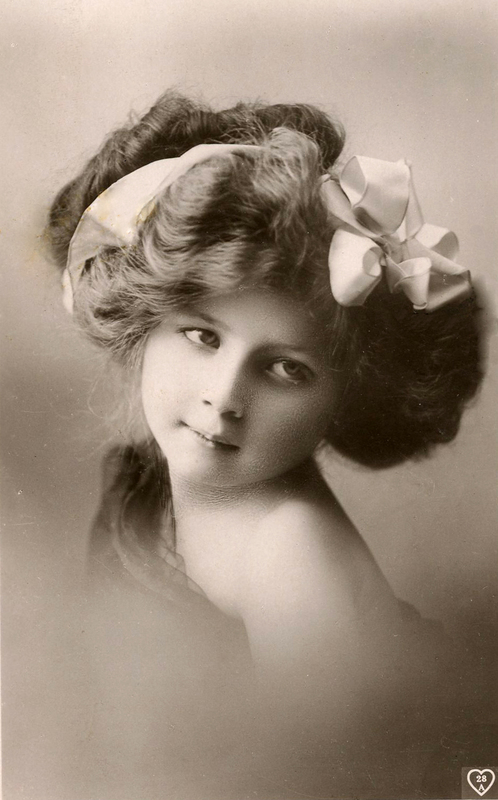 Today we have an adorable collection of 17 Vintage Photography Children – Sweet Girls. These images are Free for you to use. 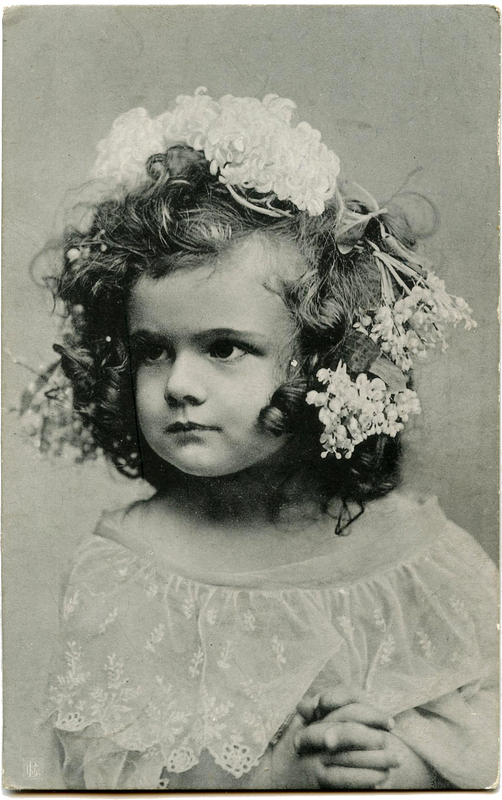 We begin with some adorable old photos that feature pretty little girls in darling outfits. Next we have a variety of postcards with sweet girls. There is even a French one. Our series ends with some unusual cuties. These images included in our Vintage Photography Children collection are just perfect for Junk Journals. A few months ago, I remember seeing some collages on a blog (sorry can’t remember where) that were created with old photos. The photos were of people but they had animal heads collaged onto them. 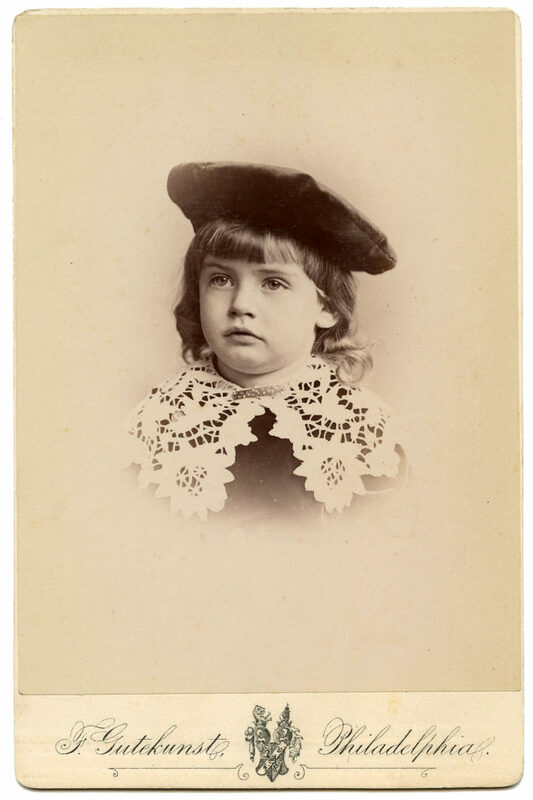 Isn’t this a Pretty Antique Child Photo? 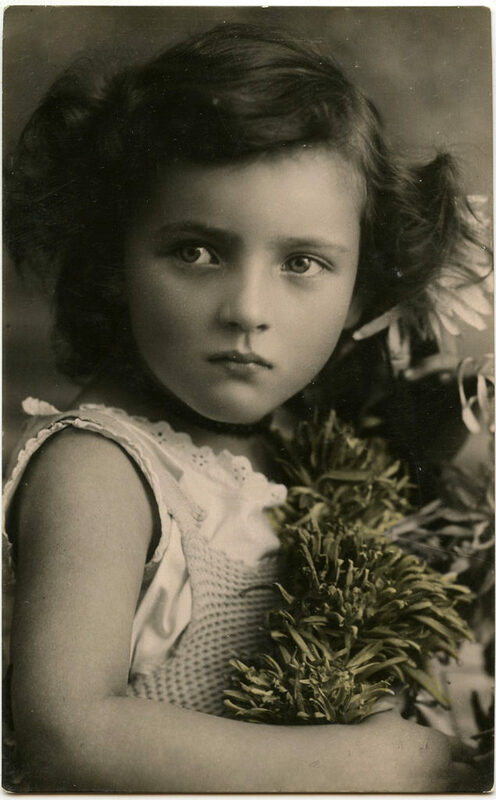 This is an Old photo of a sweet little Girl with such a pretty face! The little Girl is wearing a white cotton Eyelet trimmed dress and a pretty Pearl Headband in her hair! Great Sepia Tones are seen here too! Isn’t this Sweet Girl with Flowers in Her Hair Photo Postcard darling?!! This little girl has such beautiful clothing. The lace dress is gorgeous and all of those Millinery flowers in her hair are divine! What do you think she’s pouting about? 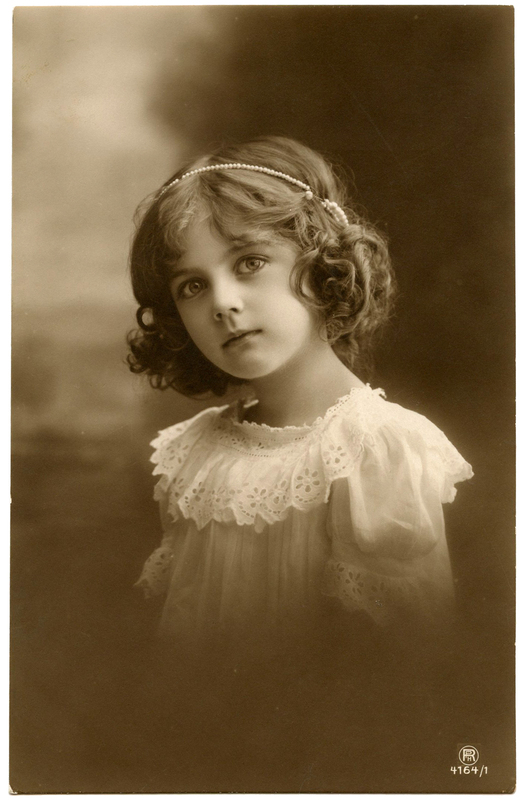 This old photo postcard features a darling little girl, with the prettiest face! I love how her eyes are glancing towards the side, it reminds me of the old Googly eyed dolls. So cute! 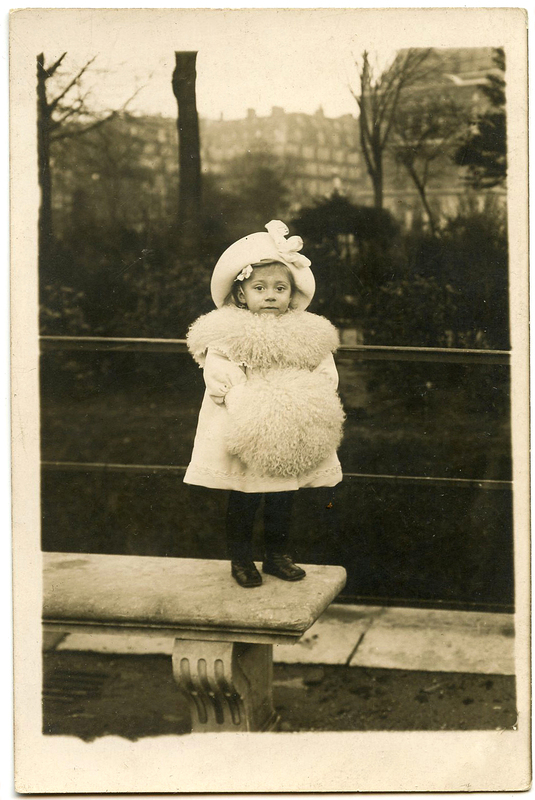 This is a sweet antique photo of a little girl wearing a beret style hat and a large lace collar. I think the collar looks so much like a lace doily. What do you think? Perhaps at the last minute her Mother whipped it off of the armrest of a chair and pinned it around her neck for the photo! I like the back of this cabinet card as much as the front, with the wonderful monogram letter G and the regal looking crest. Above is a wonderful old photo of the most precious little girl! She looks so cute with her curls tied back in the big white bow. What a sweet expression she has on her face too! 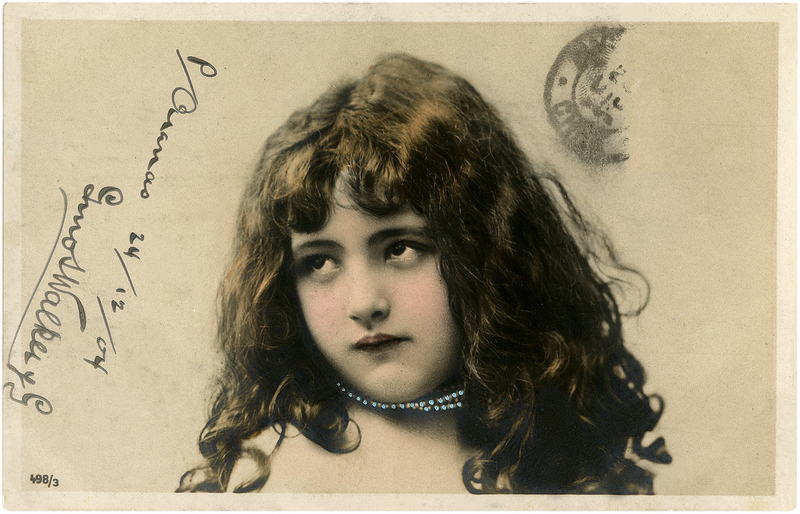 This old postcard features the most amazingly beautiful child! She has such an striking face. 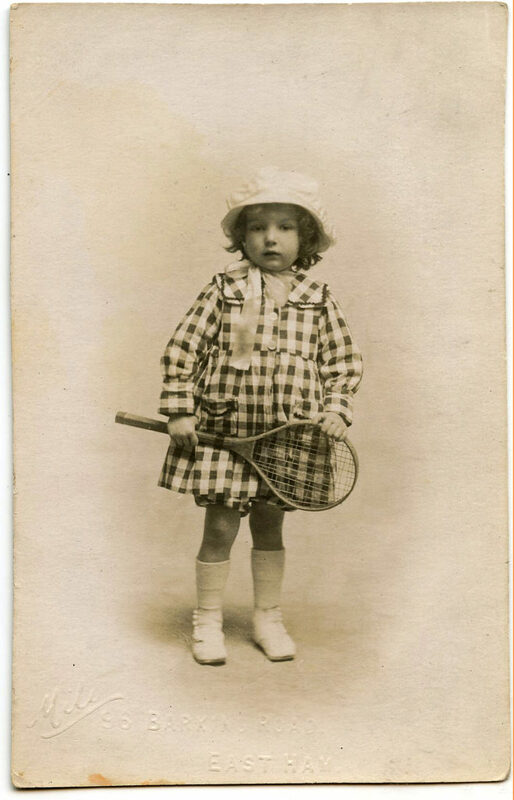 This is a British Postcard and is postmarked Circa 1911. This is a sweet Old Photo! 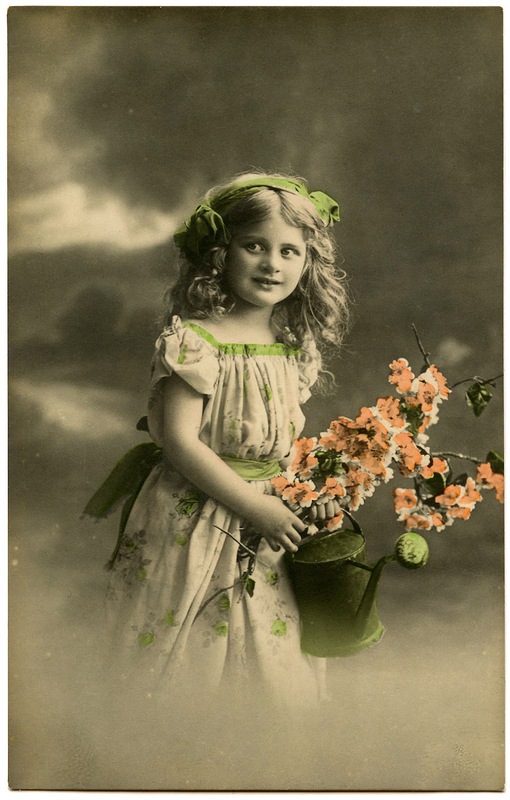 This old Postcard features a pretty little Girl with a lovely Dress! It looks like she’s been out to the Garden. She’s got a small Green Watering Can and a Bouquet of Blossoms. So sweet! This little Girl has such a gorgeous face! Her eyes are amazing! Such a beautiful Antique Photo Postcard. 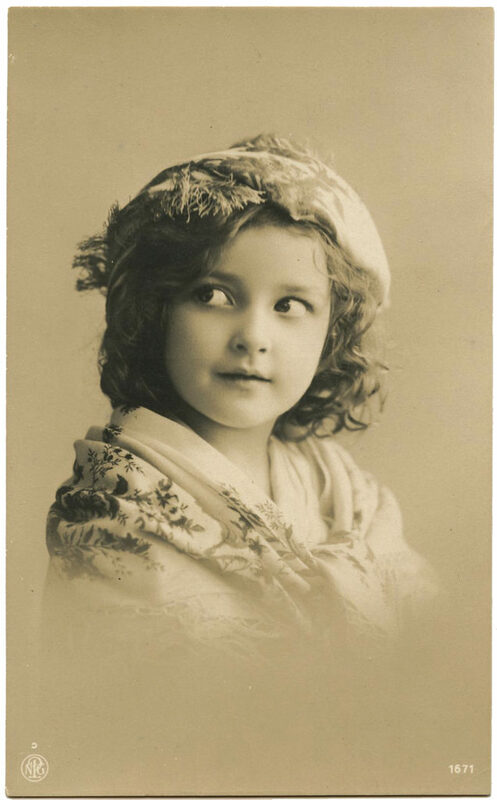 Seen above is a Vintage Adorable Child Postcard Photo! This Antique Photo Card shows a cute little girl with tousled curls looking upward! She wears a bright pearl choker. 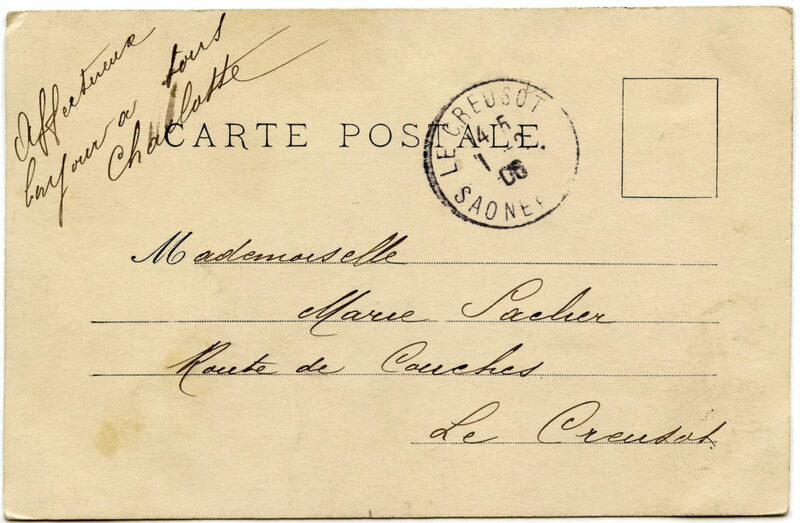 There is handwriting, a date, and a partial postmark on the image. 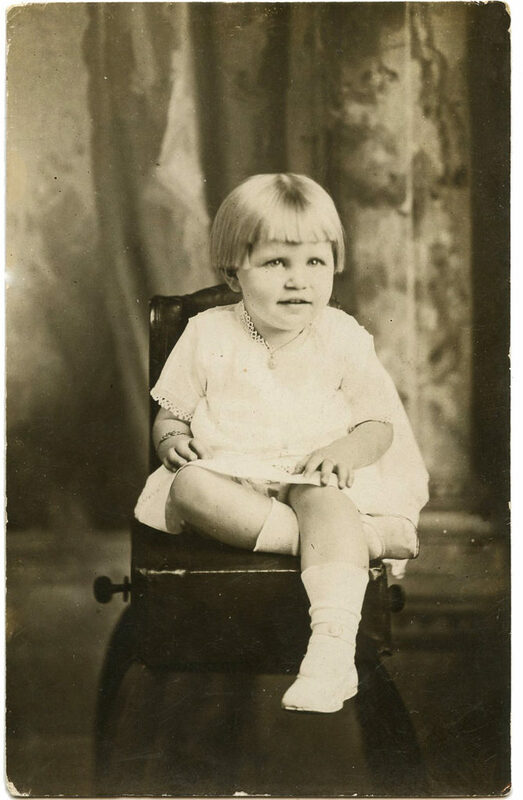 This is a darling little vintage postcard featuring a cute little girl sitting on a booster seat. I thought that the position of her legs would lend itself very well to collage work. Can’t you see her riding a big bird or some other animal?! Isn’t this sweet?!! 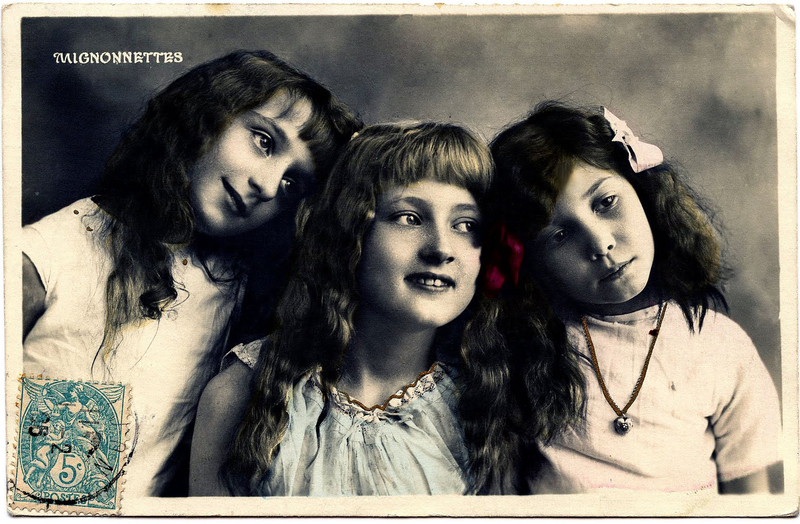 Three pretty little French girls on an antique postcard. I love the stamp on the front and the back of the postcard is lovely as well! What a nice vintage graphic for your collage work. Oh my, how cute is this one! The little girl pictured above looks so adorable in her checkered pattern dress. She’s ready to play tennis and has her racquet in hand. This is a magnificent Antique Postcard of an angelic little girl in a white first communion dress and veil. I love the Crown of flowers encircling her head! Isn’t she just so sweet? The fancy Dress has loads of tucks and lace and the veil falls into soft points below the hem of the dress. She holds a prayer book and rosary in her hands. Under her feet is a Victorian carpet with an intricate pattern. Isn’t she a cutie?!! This tiny little Girl is all bundled up for Winter in her fancy Fur Coat, Muff, and big Hat. So sweet! The original photo is at the bottom. I also created a close up photo for you to use. I personally like the original because you can see how petite she really is as she stands on that bench! 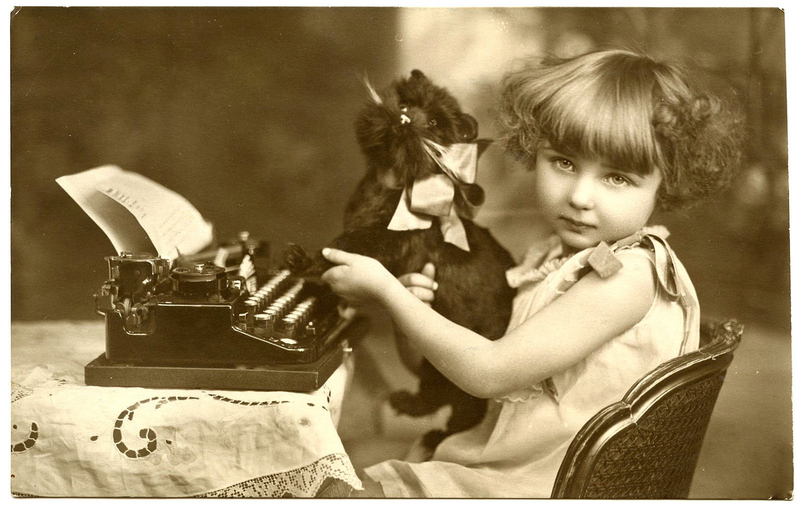 This is a darling Old Photo of a Little Girl with a Vintage Typewriter! Isn’t she precious? She’s holding a little stuffed Toy Kitty in her arms as well. I believe this was used originally as a Birthday Card. I created a second option without the greeting so that you would have more flexibility on how you use it. 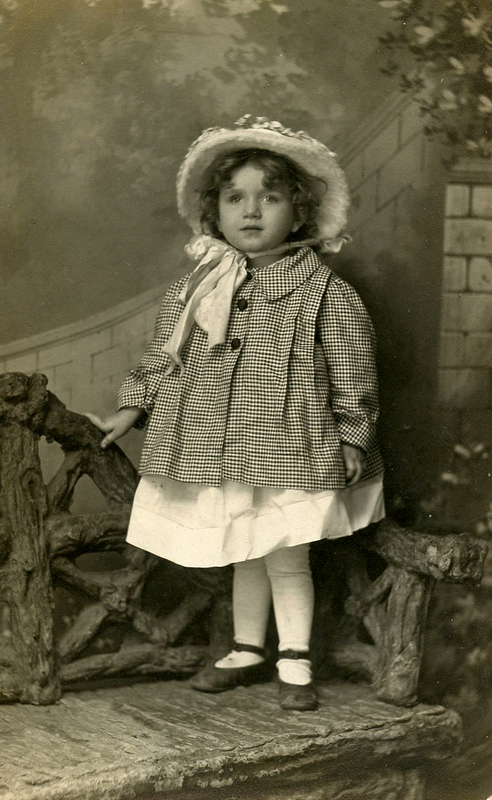 I adore this photograph above of a Cute Child in Smock and Bonnet. I love how wrinkled the little girl’s dress and gingham coat are. Additionally, I love her little tights that are sort of baggy around her knees, the pretty hat with the big bow, and the amazing faux bois bench she’s standing on. And of course I love that sweet face. She almost looks like a painting. I hope you like her too. 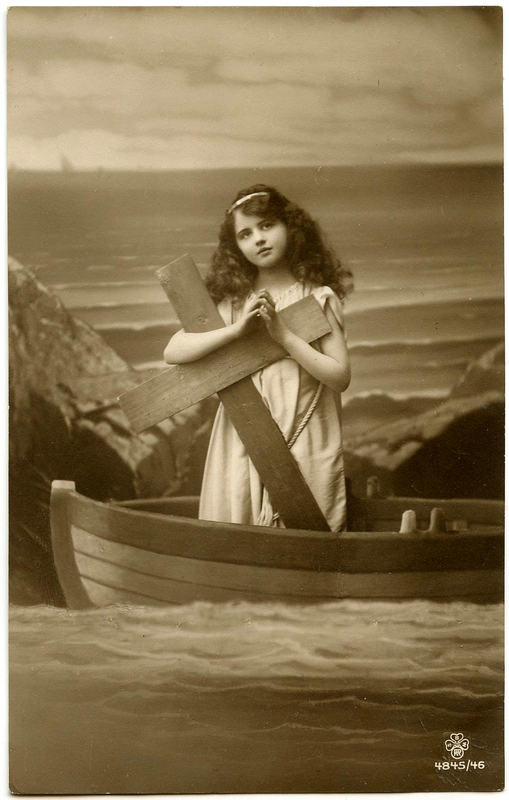 This Old Photo Postcard above shows another angelic Young Girl in a Row Boat. She’s holding a Cross, and her hands are folded prayerfully. The card doesn’t have any writing on it. I’m not sure if this was meant to be a Sympathy card or perhaps a Prayer card for someone at Sea. It has lovely Sepia tones. This is a Belgian Postcard and is postmarked 1913. 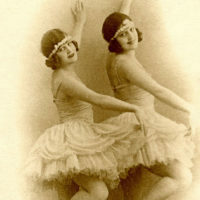 I hope you enjoyed this curated collection of 17 Vintage Photography Children – Sweet Girls – Free!! You might also like our 10 Charming Free Vintage Mother’s Day Images HERE! Charming little girls. They remind me of a photo I have of my mother at about three seated on a bench with one leg tucked under her and the other hanging down. She’s wearing a plain little dress with some embroidery on the wide collar and the three-quarter length sleeves. She has on somewhat baggy tights and high-top button shoes and her hair is cut in straight bangs across her forehead and short around her ears. She has a small, tentative smile. Wish I could show it to you. Maybe I’ll try to photograph it and send it to you. Thank you Linda, so glad you like them! These are beautiful! With the sepia tones, they really inspire the vintage look and all of them are simply gorgeous! Thank you for sharing these with us! What a lovely collection! These are fantastic Karen. Much appreciation. 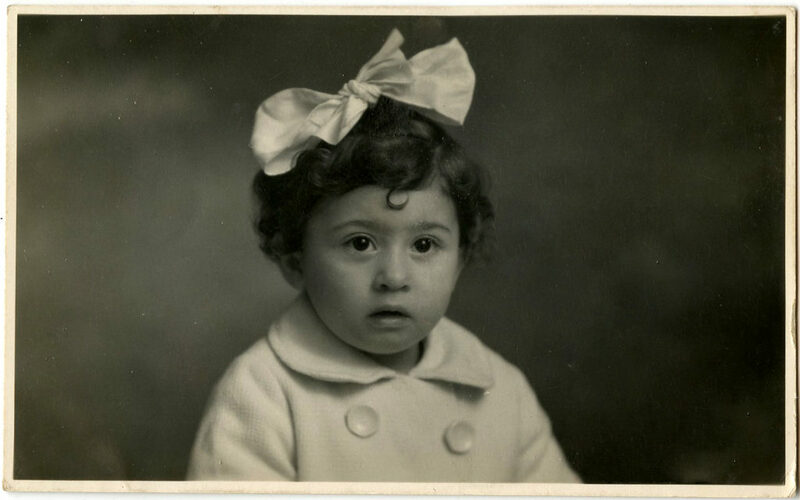 I’ve always been drawn to the real photo postcards of women and children and have a small collection of them. I’ve never seen these before. My favorite is the girl with the baggy tights and gingham coat. So precious. Thanks again.